The Blue Jays have already started clearing roster spots for their young talented players that are on the way, and more of that is likely to come later this season as well. Last season was the beginning of the roster turnover within the Blue Jays organization. This continued into the off-season when we saw veterans like Troy Tulowitzki and Russell Martin shipped off. So with the roster changeover now in full swing, which veteran player will be next to go? The answer to that question will likely be Justin Smoak. The 32-year-old’s time with the Blue Jays will likely end by either this year’s trade deadline or at the end of the season. Smoak will ultimately be a causality of his age and the timeline for when the Blue Jays front office expects to be able to contend for the playoffs. The Blue Jays aren’t expected to be playoff contenders this season, or even next season. So, that means Smoak would be in his age-34 season by the time the Blue Jays are back in playoff contention. Which makes it a logical choice to not have him on this roster after this season. Which means the Blue Jays will likely explore trade options for him this season. Smoak is still seen as an effective player at the major-league level. Last season wasn’t as productive as his 2017 season, but he was still the best-hitter on this team. The South Carolina-native first broke out in a Blue Jays uniform during the 2017 season. He played in a career-high 158 games and produced 38 home runs, 90 RBI’s, .270 AVG, .355 OBP, and a .883 OPS. He then took a step back in the following season, by appearing in 147 games and recording 25 home runs, 77 RBI’s, .242 AVG, .350 OBP, and a .808 OPS. While Smoak’s offensive numbers took a bit of a hit last season, he was still able to maintain his all-star caliber defense. He was the only first-baseman in the league last year to play in 100 or more games and commit the fewest amount of errors. In 134 games at first base, he only committed just one error, while the next person on that list was Mitch Moreland with two errors. While he didn’t sustain a major decline, it’s still something to monitor especially when you factor in his age. But, he still has value as a trade target, providing his numbers don’t seriously decline this season. The Blue Jays also have a combination of younger alternatives that would be able to step in if Smoak was shipped off. Rowdy Tellez and Billy McKinney are players who the Blue Jays are grooming to eventually take over in Smoak’s absence. McKinney is naturally an outfielder, but the Blue Jays are giving him some playing at first-base this spring. They have a surplus of outfielders who are ready to play at the major-league level. So, their plan is to subtract some of Smoak’s playing time, so that McKinney is able to receive additional at-bats throughout this season. While McKinney has never played first-base before, he did show the Blue Jays last season why they should want him in their lineup consistently. 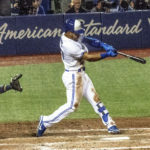 The 24-year-old converted utility-player played in 36 games last season after being acquired by the Blue Jays from the New York Yankees. McKinney recorded seven doubles, six home runs, 13 RBI’s, .252 AVG, .320 OBP, and a .790 OPS. The Blue Jays outfield expected to consist of Teoscar Hernandez, Kevin Pillar, Randal Grichuk and Dalton Pompey. Which means there won’t be many opportunities for McKinney to appear in the outfield this season. So if the Blue Jays want to get him in the lineup consistently, then Smoak’s playing time will have to be largely reduced. Tellez will be assigned to triple-A Buffalo to start the season. But, the Blue Jays would likely prefer to have a natural first-baseman at the major-league level if Smoak is to be moved at some point during this season. The soon to be 24-year-old was one of the many call-ups in September last season. Tellez opened many eyes within the Blue Jays organization with his performance last September. He produced nine doubles, four home runs, 14 RBI’s, .314 AVG, .329 OBP, .943 OPS in 23 games played. If Smoak isn’t traded this season, then he probably won’t be brought back during this off-season. He’s due to make $8 million this season. But, he will likely demand much more in his next contract. So given what Smoak is still capable of, it shows that the Blue Jays should be able to trade him and receive a quality return and continue this roster changeover that they’re so set on.